Silent screen actress Barbara La Marr was a legend in her time, leading an astounding life described by newspapers of the day as “a wilder story than she ever helped to film.” Join me, Sherri Snyder, on Saturday, March 30, 2019, at the Desert Foothills Library, 38443 North Schoolhouse Road, Cave Creek, Arizona 85331, as I portray Barbara in a self-authored performance piece, then lecture about her, detailing her oftentimes scandalous life from her humble beginnings to her tragic death at age twenty-nine in 1926. 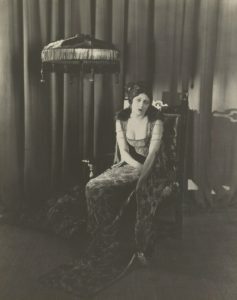 Barbara’s banishment from Los Angeles at age seventeen for being “too beautiful”; her notable careers as a dancer, a vaudevillian, a screenwriter, and an actress; her impact upon cinematic history; and her fierce determination to forge her own destiny amid the constant threat of losing it all to scandal and, ultimately, death will be spotlighted. I will also answer questions about Barbara and sign copies of my book, Barbara La Marr: The Girl Who Was Too Beautiful for Hollywood. The event, beginning at 11 a.m. and roughly an hour and a half long, is being held in the library’s Jones/Coates lecture hall and is FREE to attend. Attendees are advised to call 480-488-2286 or click here to reserve seats, as this is an encore presentation and seats may fill up again. 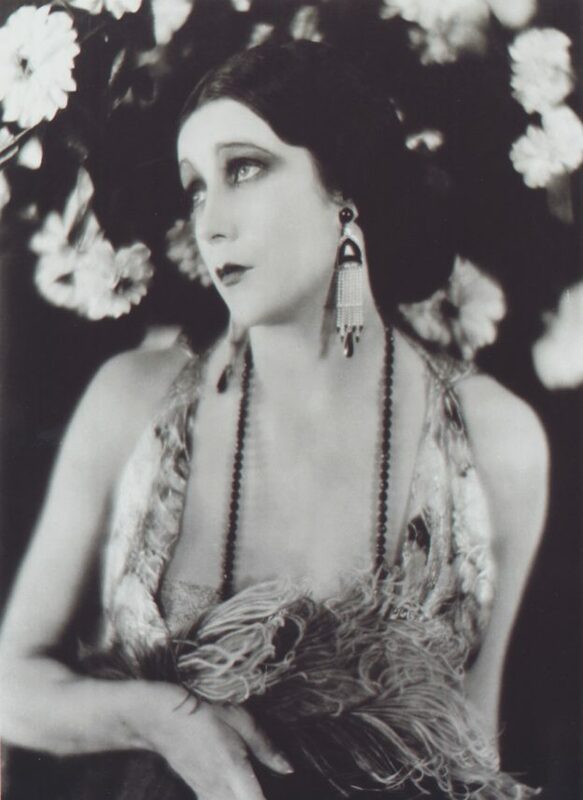 This entry was posted in Barbara La Marr Book Signings and Lectures, Performances as Barbara La Marr, Uncategorized on March 5, 2019 by Sherri. 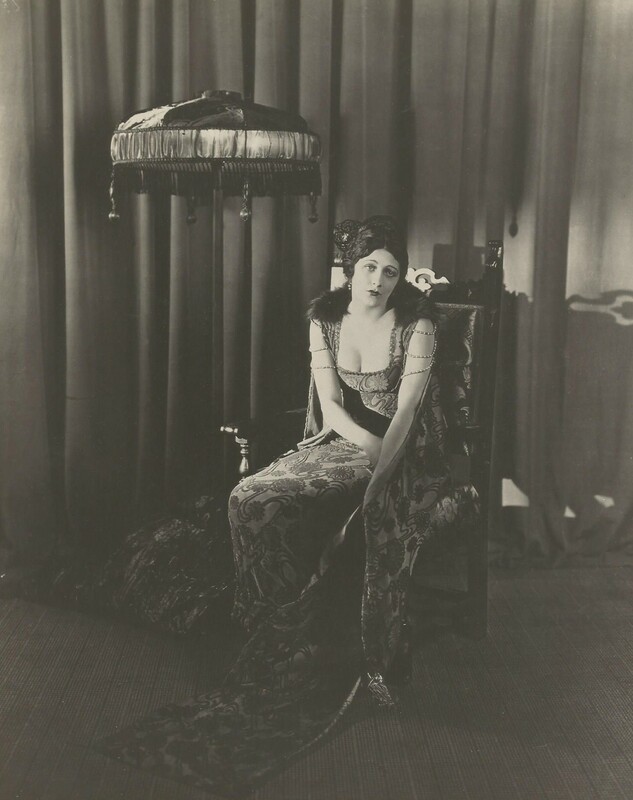 Barbara’s decision to turn down the role of Doña Sol, the mistress opposite screen idol Rudolph Valentino, in Blood and Sand (1922) in order to appear in The Prisoner of Zenda (1922) was a risky one. Director Rex Ingram, in casting her in the supporting role of Antoinette De Mauban in The Prisoner of Zenda, a story of ruses and doomed love affairs, was testing her acting abilities for a leading role as an evil seductress in his upcoming thriller, Trifling Women (formerly Black Orchids; 1922), slated to begin production after The Prisoner of Zenda. Realizing that her performance in The Prisoner of Zenda would either validate or refute Ingram’s faith in her, Barbara was determined to achieve film stardom. Even alongside a distinguished cast including Lewis Stone, Alice Terry, and Ramon Novarro, Barbara shone in the role of Antoinette, an adventuress who helps vanquish a coup by betraying her traitorous lover. Period critics, enraptured by her whole-souled acting and beauty, declared that she alone was worth the film’s admission price. Long before The Prisoner of Zenda reached theaters, however, Ingram finalized his decision to star Barbara in Trifling Women—a film Barbara later credited with securing her launch to worldwide fame. Hailed in its day as a sensational triumph and one of Ingram’s best, The Prisoner of Zenda—and Barbara’s acclaimed performance as Antoinette—may be viewed for free online here. This entry was posted in Barbara's Film Acting Career, Uncategorized on January 7, 2019 by Sherri. Thank you to film journalist and historian Phil Hall for interviewing me about Barbara La Marr and my book, Barbara La Marr: The Girl Who Was Too Beautiful for Hollywood, on his podcast, The Online Movie Show with Phil Hall. I had a great time discussing Barbara’s accomplished careers as a stock company actress, dancer, vaudevillian, storywriter for the Fox Film Corporation, and silent film actress; her turbulent early years as “the notorious Reatha Watson”; and more. The podcast may be accessed here. This entry was posted in Barbara's Early Years, Barbara's Film Acting Career, Barbara's Screenwriting Career, Book Updates, Reviews, and Interviews, Uncategorized on November 19, 2018 by Sherri. Tune in to Turner Classic Movies Tonight, September 9 (September 10 for those on EST), to watch Barbara La Marr in The Prisoner of Zenda (1922)! Directed by Rex Ingram, The Prisoner of Zenda, a gripping tale of deceptions and ill-fated love affairs, was deemed a “sensational and instant triumph” and “Ingram’s best” by Moving Picture World, and near perfection by the Philadelphia Inquirer after its release. 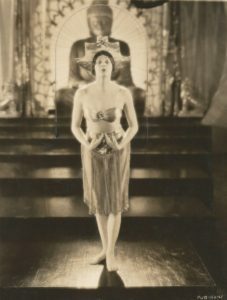 Barbara, appearing in the film in the supporting role of a cast-off woman who helps defeat a coup by betraying her deceitful lover, likewise garnered praise. Period trades commended her heartfelt performance, proclaiming her one of the screen’s most beautiful women and an actress of exceptional ability, and declaring that she alone was worth the admission price. Also featured in the film are the acclaimed performances of Lewis Stone, Alice Terry, and Ramon Novarro. Ramon Novarro and Barbara La Marr in The Prisoner of Zenda (1922). This entry was posted in Barbara's Film Acting Career, Uncategorized on September 10, 2018 by Sherri. Happy Birthday to the Lovely Barbara La Marr (July 28, 1896 – January 30, 1926)! 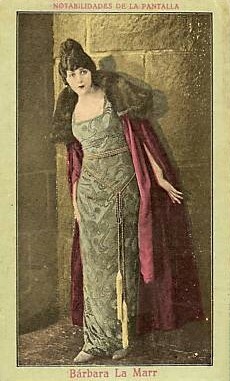 Barbara in one of her Prisoner of Zenda costumes, 1922. “glittering, enchanting personality”: Ramon Novarro, “Ramon Novarro Tells of His Screen Loves,” Movie Weekly, April 25, 1925, 5. “[Barbara] was as lovely”: Terry quoted in Jimmy Bangley, “The Legendary Barbara La Marr,” Classic Images, May 1996, 17. “regular girl”: Regina Cannon, “‘My Private Life’s My Own Affair,’ Declares Barbara La Marr,” Movie Weekly, May 31, 1924, 3. “a whole-souled and loving girl”: New York Graphic quoted in “Newspaper Opinions,” Film Daily, February 28, 1926, 197. “of the mind and spirit”: Goldbeck quoted in Adela Rogers St. Johns, “The Life Story of Barbara La Marr,” Liberty Magazine, December 15, 1928, 67. This entry was posted in Uncategorized on July 28, 2018 by Sherri.